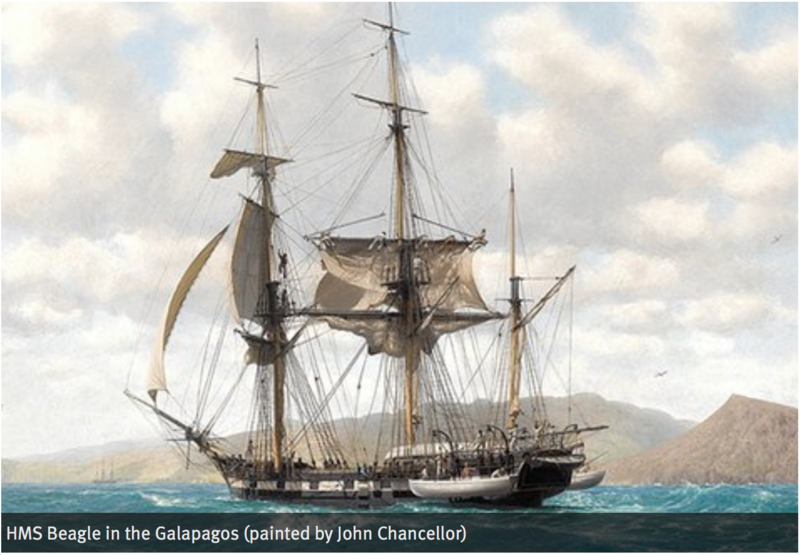 In preparation for our Voyage of the Samba in the Galapagos Islands I’ve been reading the chapter of Darwin’s Voyage of the Beagle that describes his 31 days in the archipelago. Darwin felt the reptiles of the Galapagos gave the “most striking character to the zoology ” of the islands. He spends considerable time in his diary describing the creatures for whom the Spaniards named the islands. the giant tortoises. A Galapagos giant tortoise can weight up to 600 pounds and live up to 150 years. A distinct species of tortoise developed on each separate island, adapting to differing environments. 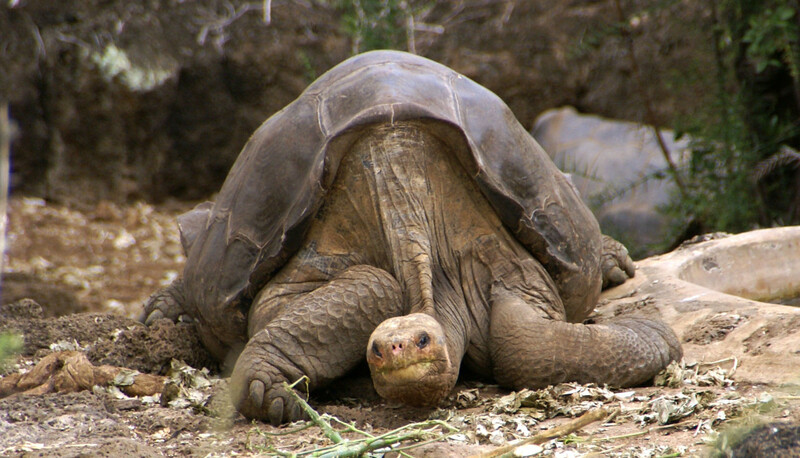 Lonesome George was the last survivor of the abingdonii subspecies, which became extinct with his death on 24th June, 2012.
lumbering (4 miles per day) tortoises when they traveled to the central highlands to fill themselves with water. Prior to encountering humans the tortoises had had no natural predators and both the natives and the crews of whaling ships feasted on their easily obtained meat. “The inhabitants believe that these animals are absolutely deaf; certainly they do not overhear a person walking close behind them. I was always amused when overtaking one of these great monsters, as it was quietly pacing along, to see how suddenly, the instant I passed, it would draw in its head and legs, and uttering a deep hiss fall to the ground with a heavy sound, as if struck dead. I frequently got on their backs, and then giving a few raps on the hinder part of their shells, they would rise up and walk away; — but I found it very difficult to keep my balance. When I came across this description I was flabbergasted. Not at the inhabitants drinking tortoise urine (for indeed the tortoise does use his giant bladder as a water reservoir during times of drought) but at the Galapagoans drinking pericardial effusions. The pericardium is the sac around the heart. I am very familiar with the pericardium in humans as I look at it on every one of the many echocardiograms I read. Normally, it has only a very tiny bit of fluid in it, enough to lubricate the heart as it contracts and relaxes. Thus, in a normal giant tortoise one would not expect more than an ounce of liquid in the pericardium-hardly worth butchering an ancient kind beast. In the video below one can see a small to moderate sized pericardial effusion (the black crescent on the left of the heart) which corresponds to about 90 ml or 3 ounces. Serous means ” typically pale yellow and transparent” and limpid, Darwin’s term, means transparent and clear. Some diseases cause inflammation of the pericardium (pericarditis) and with this fluid (pericardial effusion) can build up in the pericardial sac. Large pericardial effusions compress the heart, impeding blood from entering it, and can cause shock and death (tamponade). Pericardial effusions due to inflammation typically are not limpid as they contain blood cells and protein from the inflammation of the pericardium. If the inhabitants were sometimes encountering significant amounts of tasty, yet limpid fluid in the pericardial sac of the giant tortoises was this normal or did it indicate the turtles had pericardial disease? I was unable to find any indication that giant tortoises suffer unduly from pericardial disease but I did encounter one study which utilized ultrasound to document a pericardial effusion in an 80 year old spur-thighed tortoise which was suffering from pneumonia. Consequently, I’m looking into taking a portable ultrasound device to take with me to the Galapagos to examine the hearts of the giant tortoises and answer once and for all the mystery of the giant tortoise pericardial fluid. 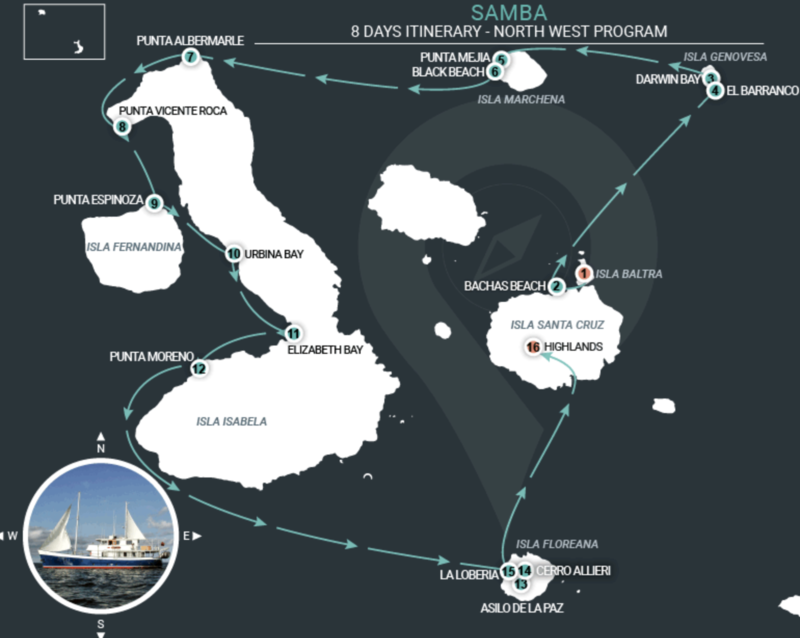 In August, the skeptical cardiologist and his eternal fiancée (and our friends Dave and Barb) will be visiting the Galapagos Islands on the 78 foot yacht, the Samba. 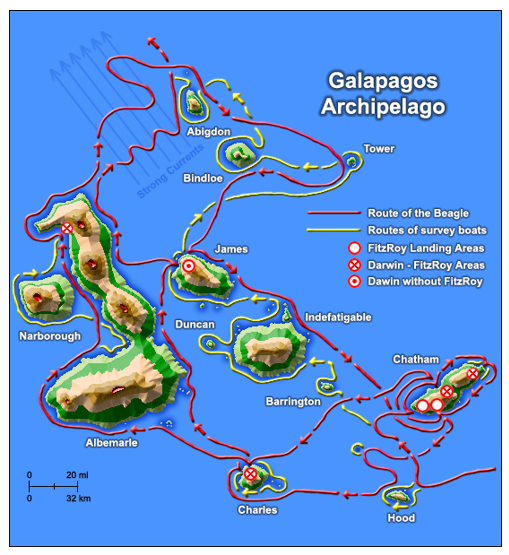 I’ve long wanted to visit this archipelago with its fascinating geographic and biologic features and its connection with Charles Darwin. During my last year at Cambridge I read with care and profound interest Humboldt’s Personal Narrative. This work and Sir J. Herschel’s Introduction to the Study of Natural Philosophy stirred up in me a burning zeal to add even the most humble contribution to the noble structure of Natural Science. 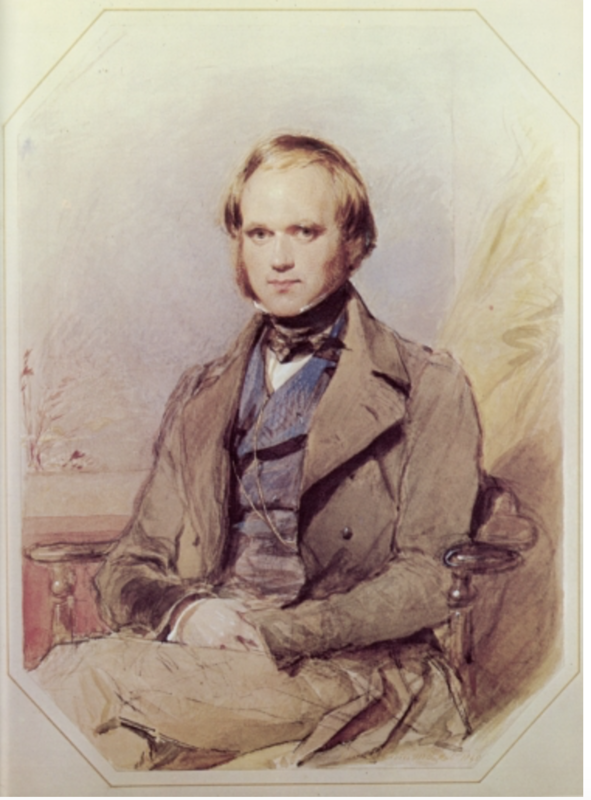 After graduating Cambridge, Darwin, being recognized as “a young man of promising ability, extremely fond of geology, and indeed all branches of natural history,” was offered a position on a ship destined for a 5 year voyage around the world. This would profoundly influence his life and mankind’s vision of its origin. Captain Robert Fitzroy..As Darwin gathered the threads of what would later become his ‘dangerous idea’, FitzRoy guided them safely through treacherous waters, measured tides, studied weather systems, surveyed new territory, corrected existing charts and, for the first time, established a series of reference points around the globe that others would calibrate their instruments by. 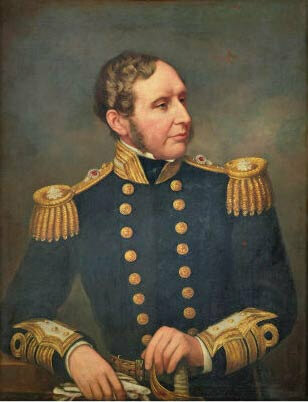 courtesy RNLIWhen Darwin published On the Origin of Species, FitzRoy admitted that it caused him the ‘acutist pain’. As a passionate creationist, he was wracked with guilt at unwittingly playing a part in its construction. This, along with mounting debts and failing health, soon locked him into a losing battle with depression. Just weeks before his 60th birthday, Vice Admiral FitzRoy took his life. HIS MAJESTY’S ship, Beagle, under the command of Captain FitzRoy, was commissioned in July, 1831, for the purpose of surveying the southern parts of America, and afterwards of circumnavigating the world. In consequence of Captain FitzRoy having expressed a desire that some scientific person should be on board, and having offered to give up part of his own accommodations, I volunteered my services; and through the kindness of the hydrographer, Captain Beaufort, my appointment received the sanction of the Admiralty. The Beagle was only 12 feet longer than the Samba motored sailing boat that we, along with 12 other adventurous passengers, 5 crew men and a guide, have selected for our Galapagos tour. However, Darwin’s vessel carried, in addition to Fitzroy and Darwin, 71 other passengers (whose names you can ponder here). “SEPTEMBER 15th. — This archipelago consists of ten principal islands, of which five exceed the others in size. They are situated under the Equator, and between five and six hundred miles westward of the coast of America. They are all formed of volcanic rocks; a few fragments of granite curiously glazed and altered by the heat, can hardly be considered as an exception. Darwin disembarked on San Cristóbal (September 17-22), Floreana (Charles)(September 24-27), Isabela (Albemarle)(September 29-October 2) and Santiago (James)(October 8-17). FitzRoy and his officers developed updated charts of the archipelago, while Darwin collected geological and biological specimens on the islands. I discovered, though unconsciously and insensibly, that the pleasure of observing and reasoning was a much higher one than that of skill and sport. The primeval instincts of the barbarian slowly yielded to the acquired tastes of the civilized man. So, dear friends and patients, pay close attention to the shape of my head upon my return from the Voyage of the Samba. You might assume the large occipital protuberance is a result of a nasty fall from the top of a giant tortoise when, in fact, it is the outward representation of all the brilliant observations and dangerous ideas I have acquired on my trip. N.B. Of the many observations that Darwin made while he was on the Galapagos Islands, I found his comments on the pericardium of the giant tortoises the most intriguing. My next post on Darwin and the Galapagos will explore in detail this fascinating cardiologic observation.